I have been obsessed with all things lemon these days. I just love the way it freshens a dish up. Lemon works great in sweet or savory dishes. I am a huge fan of lemon bars and wanted to make something similar. 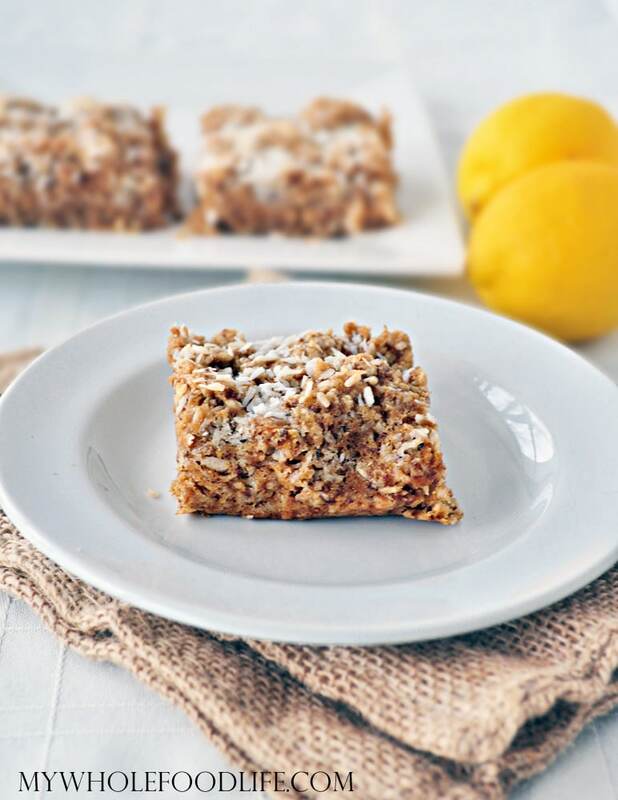 These coconut lemon bars are so good! Vegan and gluten free. The coconut and lemon just go so well together. These coconut lemon bars didn’t even last the weekend at our house. My husband ate them all! If you enjoy lemon flavored desserts, you may also enjoy my Lemony Cookie Dough Bites or my Lemon Larabar Bites. In one bowl, cream together the coconut sugar, eggs, lemon zest, vanilla and coconut oil. In another bowl, mix the shredded coconut, oat flour, baking powder, and salt. To make the filling, mix the coconut butter, lemon juice and maple syrup in a blender or food processor . Stir in the chia seeds. Set aside for a minute so the mixture can thicken. Line an 8x8 baking dish with parchment paper. Leave enough paper to stick out the sides. Gently press 1/2 of the dough in the bottom of the pan. The dough will be sticky. Sometimes using a wet spatula helps spread it easier. Spread the lemon mixture on top of the dough. Once the lemon is all spread, top it off with the remaining dough. I added the top layer in clumps, so it resembled more of a crumble. Once the pan has completely cooled, lift the mixture out and cut into bars using a pizza cutter. A few things to note about this recipe. When you cut the bars, they will seem crumbly. If you place them in the fridge after baking, they firm up quite nicely. You could even put them in the fridge for 30 minutes to firm up before you cut them. They are supposed to be like crumb bars, so they will crumble a little. We ate ours with a fork. I promise they are so good! Would thus work with almond or coconut flour instead? I am not sure. I haven't tried it that way. Yum, yum, yum! I have got to try these! Thanks for sharing! These look so good! I love coconut and lemon, but have never thought to put them together! Cannot wait to try these! Thanks Casey! I love these bars and I hope you do too. Is there anything I can substitute instead of coconut sugar? I may have enough coconut sugar for a one batch but I wanted to double the batch and put it in the big bar pan. I think we should marry this lemon bar with your blueberry crumb bar and make a new baby. I love both!! That sounds like a fab idea!! Whole Food Lunches + a MightyNest Giveaway!